Luciana in considering a small quote from Gareth Hind’s graphic novel version of the Odyssey, decided that Odysseus must have had considerable charisma. She claimed that Nestor implied this when he suggested to Telemachus that should Odysseus return, he would have no trouble in whipping up support and returning with the ‘whole force of the Acheans behind him’. At this point she began to think about what it was in a leader that could command this following, hence ‘charisma’. Luciana explored the entry in Online Etymology Dictionary and then speculated on the morphology of the word. You can see her thinking in this short video. Luciana has challenged my thinking as I too speculate about the morphemes involved. Off to sift through the OED entries! 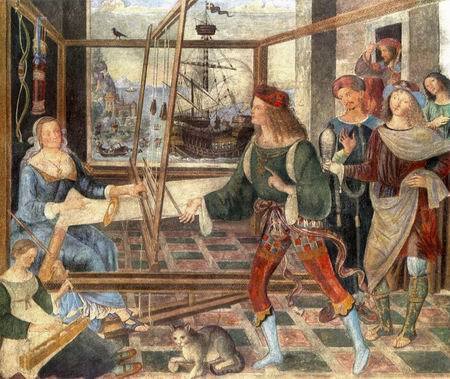 The image is Pinturrichio’s 1509 painting titled Odysseus’s Return. I’m not quite sure whether Odysseus is the figure entering the door, or the splendidly dressed central figure facing the ever patient and resourceful Penelope at her loom. If Odysseus did indeed strut around in those colourful trousers, it could go some way to explain his charisma and allure! Oh Luciana, what an amazing word! You’ve set me off on a wonderful weekend challenge. An excellent opportunity to test the limits of the Free BSD in Word Searcher as well as the OED. I do hope you’ll share what you find. Congratulations, Luciana! You have given us a splendid demonstration of orthographic reasoning. Looking at the evidence that you present, I think that the analysis might be this. Since our word has its origins in Greek, I write the etymons with the Greek alphabet, as I hope that you will all also be doing before long. You found that the dictionaries show us that ‘χαρισμα ➞ charisma’ is derived from ‘χαρις ➞ charis’, “grace favour, kindness, gratitude”. Then you wondered about the structure of ‘charis’. I know that the final ‘is’ of ‘charis’ can be regarded as a suffix from Greek-origin words like this. From this evidence I can analyse ‘χαρις’ as ‘χαρ + ις ➞ char + is’. If I then substitute the suffix ‘-ism’ for ‘-is’ I have ‘char + ism ➞ charism’ – Voilà! So ‘charism’ is the form that we would expect in English, and that is what it was at first (around 1640). It was a term that the Church used to refer to the gift of the “grace and favour” of God in the form of special personal gifts such as prophecy and “speaking with tongues”. It was all about powerful and persuasive preaching in Christian communities. It was a specifically religious term, and – written as ‘charism’ – it still is. The non-religious sense of “A gift or power of leadership or authority, the capacity to inspire devotion or enthusiasm” is comparatively recent (less than a hundred years ago). To make the distinction between the religious and non-religious sense, the form ‘charism’ has kept its religious denotation, but for the non-religious sense we now use the full original Greek form ‘χαρισμα ➞ charisma’ as a loan word. I know it’s a loan word because complete ‘native’ English words do not have a final grapheme ‘a’. The form , then, is the expected form while the form is a reborrowing of the original word as a direct loan word. Back in Greek, neuter singular nouns like ‘χαρισμα ➞ charisma’ had the plural form ‘χαρισματα ➞ charismata’ whose stem ‘χαρισματ- ➞ charismat-’ is also that of ‘charismat + ic’. So, together with the fact that there is an identifiable ModE suffix ‘-ate’, I am happy to propose the analysis: ‘char + ism + ate/ +ic ➞ charismatic’. You mention that “one of the assistants” of the goddess Aphrodite was Charis. Actually, there were three of them: their names were Aglaia, Thalia and Euphrosyne. Together (and they were always portrayed together) they were known as the three ‘Χαριτεϛ’ which is the plural of ‘χαριϛ’. The Romans referred to this trio as ‘Gratiae’ – the Graces. And that gives us another link. If you’ve been to Greece, you’ll probably know that “thank you very much” in Greek is “ευχαριστω πολυ”. The first word is the verb; it means “give thanks”. It is the root of the Christian term ‘eucharist’. And I’m sure you have already noticed that our word ‘χαρις’ is well and truly present in ‘ευχαριστω’. So, if the Latin equivalent of the Greek Three ‘Charites’ were the Graces, and the Greeks said “thank you kindly” with a verb whose base element was the same as the Charites, how do we say ‘thankyou’ in Italian and Spanish? Thankyou so much O.G. for such a lucid explanation into the difference between religious charism and the more recent mundane sense. Really interesting and a fascinating link to grace. Luciana will be extremely interested in all this.